As you know living gluten free is a major passion of mine. I was introduced to a gluten free diet in my late teens. Since completely giving it up after realising how much more out of my health I can gain by simply giving up one ingredient, I couldn’t go back. One of the major things I’ve learnt on my journey is that our skin is a reflection of what we eat and how we treat it. Glowing from the inside out is one huge benefit I noticed within weeks of completely giving up gluten. While doing more research on this it was no surprise to me when I discovered that going gluten free can also have anti-ageing effects while make you look and feel younger. All that from just cutting out gluten. I won’t go into detail but Gluten is a substance that wears out the body’s metabolic and immune reactions, making you appear old inside and out. By simply removing it from your diet plan, you get to replenish your life force, fight ageing and allow your natural processes to work as they were developed to do. Wheat, rye and barley are recognized as the main sources of gluten and are highly discouraged among those who want to keep their vitality as well as adhere to a gluten free eating lifestyle. But to understand how their consumption contributes to the ageing process, you have to look into three biological mechanisms – glycation, inflammation and oxidation. Glycation pertains to the covalent bonding of lipid, protein and sugar molecules to keep them from being taken up. Conveniently, the outcome of this process are substances called Advanced Glycation End Products (abbreviated as AGEs) and they cause protein fibers to become malformed and stiff, leading to wrinkles, stiffness and poor organ performance. Although glycation is normal, the presence of non gluten free diet rations increases the production of AGEs in the body. And with the overwhelming levels of sugar it goes with, the system eventually succumbs to the pressure and develops premature ageing symptoms, not to mention Type 2 Diabetes. To fight ageing, it is essential that you will control your sugar intake (no refined sugars, aim for naturally occurring sugars only) and diminish the frequency of glycation by eliminating big contributors such as whole wheat foods like breads, pastas, crackers etc. Inflammation is the body’s way of ridding itself of harmful stimuli and it involves a complex network of responses that cause pain, redness, swelling, heat and loss of function. In chronic cases, progressive destruction of tissues can occur, leading to signs of ageing that we often dread – poor memory, poor reflexes and or blemishes on the skin for example. 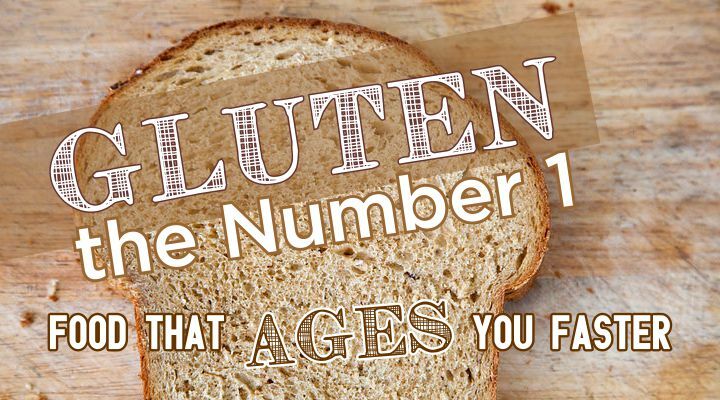 A non gluten free diet encourages repeated inflammatory processes, especially among those with sensitivities, and this produces a haggard appearance and sensation among those who are affected. Oxidation pertains to the introduction of oxygen to different substances in living tissue. In chemistry, it is defined as the loss of an electron. Oxidation is necessary for change – to turn potential to kinetic energy, to transform an ordinary element into something stronger. But in extreme cases, it can be bad and such condition is represented well by a rusting pipe or a spoiled piece of fruit. When gluten is oxidized in the body, the sulphur containing amino acids it possesses creates a bridge between the fibers and causes protein to harden. As earlier mentioned, when this happens, parts of the body that absorb the abnormal nutrient starts to lose their suppleness and elasticity, leading to pain and sagging skin. Since one cannot stop oxidation from occurring, the best natural anti-ageing means to follow is adhering to a gluten free diet. Not only will you keep your physical youth, you’ll also get to avoid its unpleasant long-term effects to your internal system. Want to find out more about Going Gluten Free? Have any questions, feel free to contact me or leave your comments below. I’d love to hear from you.